Now, look at this picture. Imagine that your place has suddenly been transformed into a swing-dance sock hop (or, if you prefer, the dancers can keep their Capezios on). 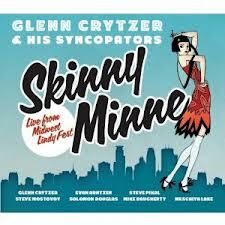 Yes, the new CD by Glenn Crytzer and his Syncopators, SKINNY MINNE, recorded live on May 4 and 5 at the Midwest Lindy Fest in Minneapolis (hence the title) has just that effect. I know the idea bends time and space and delivers an uppercut to the laws of physics, but when Swing is concerned, it trumps anything you learned in high school science class. And this CD is all about the many colors and flavors of Swing. The Syncopators are Steve Mostavoy, trumpet; Evan Arntzen, reeds; Solomon Douglas, piano; Glenn Crytzer, guitar; Steve Pikal, string bass; Mike Daugherty, drums; Meschiya Lake, vocals. And, typically, they mix fresh readings of venerable songs (with roots in Count Basie, Fats Waller, Django Reinhardt and Stephane Grappelli, Illinois Jacquet, Artiie Shaw, Coleman Hawkins, Duke Ellington, and Sidney Bechet) with originals that are so deeply idiomatic that they are both delicious surprises and totally in the groove(s). And Meschiya’s singing is as rich, smoky, and enticing as ever. The songs are ONE O’CLOCK JUMP / J’ATTENDRAI / SKINNY MINNE / BOTTOMS UP / THE GRASS IS ALWAYS GREENER / THE SAD SACK / YACHT CLUB SWING / BLUE SPIRIT BLUES / JACQUET IN THE BOX / EL SALON DE GUTBUCKET / THE GRABTOWN GRAPPLE / DEEP DOWN IN CAROLINE / C JAM BLUES / HOP, SKIP AND JUMP / EGYPTIAN FANTASY / BLUES FOR NORMA / IT DON’T MEAN A THING (IF IT AIN’T GOT THAT SWING). 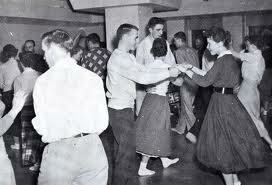 And because this music was recorded live at a Lindy Fest, the band is especially loose and animated . . . there’s none of that constriction that sometimes befalls musicians in the recording studio where they can’t see each other, they hear each other through headphones, and they are understandably xonxerned that no mistakes be made. You’ll hear what it sounded like to be there: an immense asset! To effect this magic in your own home, which translates as “To order the CD,” click here. 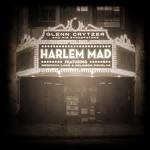 Once you’re on Glenn’s site, you can hear samples of the music he has created on three compact discs.